Attacks across Iraq targeting mainly Shi'ite Muslims killed at least 30 persons on Sunday, the police and medics said, intensifying fears of a descent into all-out sectarian war. Ten years after the US-led invasion that toppled Sunni leader Saddam Hussein, a stable power-sharing compromise between Iraq's Sunni, Shi'ite and ethnic Kurdish factions is still elusive and violence is on the rise. Top US intelligence officials have said that information gleaned from two controversial data-collection programmes run by the National Security Agency (NSA) thwarted potential terrorist plots in the US and more than 20 other countries and that the gathered data is destroyed every five years. A woman Lashkar-e-Jhangvi suicide bomber carried out the devastating attack on a university bus carrying women and her male accomplice struck a hospital in Pakistan's southwestern city of Quetta, police said, as the death toll today rose to 26 in the multiple strikes. The election of moderate cleric Hassan Rowhani as Iran president signals a return of hope and reforms and that the people desire a policy of moderation over extremism, newspapers said today. Former Pakistan President Pervez Musharraf has been indicted by an anti-terrorism court over the detention of dozens of judges during the emergency rule he imposed in 2007. Musharraf, 69, was indicted during a hearing of the case held at his farmhouse in Chak Shahzad yesterday by anti-terrorism court Judge Kausar Abbas Zaidi. He was indicted under provision of the Anti-Terrorism Act and the Pakistan Panel Code. After the charges against him were read out, Musharraf refused to accept them and pleaded not guilty. He filed an application for his acquittal due to lack of evidence. A 10-year-old girl was forcibly married to a 50-year-old man in Pakistan's Punjab province under a custom in which a girl can be offered in marriage to resolve a feud, according to a media report today. 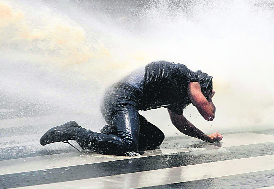 Riot police fired occasional bursts of teargas in Istanbul on Sunday after a night of unrest to try to prevent anti-government demonstrators from regrouping ahead of a rally by Prime Minister Tayyip Erdogan's ruling party. Bulldozers removed barricades and municipal workers swept the streets around the central Taksim Square, sealed off by the police. The Constitutional Court of Kuwait on Sunday ordered the dissolution of parliament and called for fresh elections, officials in the US-allied Gulf Arab said. The court made its ruling after throwing out an opposition challenge to changes to the electoral system decreed by the emir, hereditary ruler of the oil-exporting country, head judge Youssef al-Mutawa told reporters. Pakistan should accelerate the gas pipeline project with Iran or the latter would impose financial punishments on Islamabad, an Iranian source said. Attacks across Iraq targeting mainly Shi'ite Muslims killed at least 30 persons on Sunday, the police and medics said, intensifying fears of a descent into all-out sectarian war. Ten years after the US-led invasion that toppled Sunni leader Saddam Hussein, a stable power-sharing compromise between Iraq's Sunni, Shi'ite and ethnic Kurdish factions is still elusive and violence is on the rise. More than 1,000 persons were killed in militant attacks in May, according to the United Nations, making it Iraq's deadliest month since the inter-communal strife of 2006-07. Regional sectarian tensions have been inflamed by the conflict in Syria, Iraq's neighbour, where Sunni rebels are fighting to overthrow a leader backed by Shi'ite Iran. Two car bombs exploded minutes apart in the predominantly Shi'ite southern oil hub of Basra, 420 km southeast of Baghdad, killing at least five persons and tearing off shop fronts. "We heard a bang and rushed outside," said Ali Fadhil, who was working at a nearby bakery. "I saw cars on fire, dead bodies covered with blood, and wounded people lying on the ground screaming for help. When the police arrived, a second blast struck, which was even more powerful, leaving the street in a state of total destruction." Another car bomb exploded in a busy market in the Shi'ite holy city of Najaf, killing at least seven persons. Blasts also targeted Shi'ites in Nassiriya, Kut, Hilla, Tuz Khurmato and Mahmudiya in southern Baghdad. Near the northern city of Mosul, gunmen shot dead six policemen at a checkpoint in Hadhar, the police said. No group has claimed responsibility for the attacks so far, but Sunni Islamist insurgents and Al-Qaida's Iraqi wing have increased their activities this year, seeking to provoke wider confrontation between Sunnis and Shi'ites. No other new details about the plots or the countries involved were part of the newly declassified information released to Congress and made public by the Senate Intelligence Committee. Intelligence officials said they were working to declassify the dozens of plots NSA chief General Keith Alexander said were disrupted, to show Americans the value of the programmes, but that they wanted to make sure they did not inadvertently reveal parts of the US counter-terrorism playbook in the process. 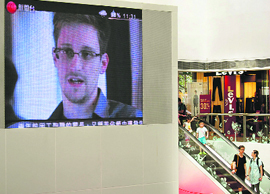 The release of information follows a bruising week for US intelligence officials who testified in Congress, defending programmes that were unknown to the public and some lawmakers until they were revealed by a series of media stories in The Guardian and The Washington Post newspapers, leaked by former NSA contractor Edward Snowden, who remains in hiding in Hong Kong. The disclosures have sparked debate and legal action against the Obama administration by privacy activists who say the data collection goes far beyond what was intended when expanded counter-terrorism measures were authorised by Congress after the terror attacks of September 11, 2001. Intelligence officials said yesterday that both NSA programmes were reviewed every 90 days by the secret court authorised under the Foreign Intelligence Surveillance Act. Under the programme, the records, showing things like time and length of call, could only be examined for suspected connections to terrorists, they said. The banned sectarian outfit Lashkar-e-Jhangvi (LeJ) has claimed responsibility for yesterday's attacks on the bus and at the Bolan Medical Complex, saying they were carried out in retaliation for a raid against the group by security forces. A senior security official today said the first blast was carried out by a woman suicide bomber on the bus of the Sardar Bahadur Khan University for women medical students in which fourteen students were killed. About 40 students and teachers were in the bus, waiting to go home after classes. Twenty-two women were injured by the powerful blast. According to the official, who declined to be named, the woman bomber had managed to sneak in and get on the bus and detonate herself causing the extensive damage and killings. 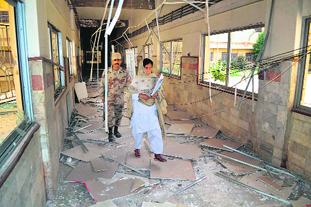 After the attack when the injured were shifted to the Bolan Medical Complex, a male suicide bomber and other heavily armed militants struck the building, firing indiscriminately. At least 12 people including four militants, four nurses and the Deputy Commissioner of Quetta were killed in the nearly four hours siege of the complex where the injured students were brought for treatment, the official said. "The siege only ended after an extensive gun battle and a male suicide bomber blowing himself up," the official said. 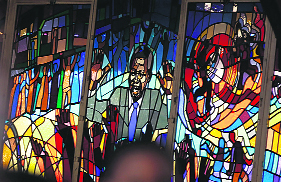 "The militants had planned everything out... The male suicide bomber was waiting inside BMC Hospital ward for the arrival of high level officials, including the Chief Secretary, and blew up himself when they reached," he said. Reports said the university bus was assigned for students from a nearby neighbourhood dominated by the Shia Hazara community, which has been the target of several attacks by the LeJ. Islamabad: Interior Minister Chaudhry Nisar Ali Khan has said the government will hold dialogue with only those militants who surrendered and accepted govt's writ. Nisar said an operation had been completed at Bolan Medical Complex in Quetta, resulting in the killing of four terrorists and arrest of one of their accomplices. "A salute to Iran and to the Sheikh of hope," the pro-reformist Etemad daily declared on its front-page over a colour picture of a smiling Rowhani flashing a V-for-victory sign. "The sun of my moderation has risen," said Arman, another pro-reformist publication. Rowhani was declared Iran's new president yesterday, ending eight years of Mahmoud Ahmadinejad's conservative grip on the top job that had isolated the Islamic republic internationally. Shargh, another reformist daily, said Rowhani's election means "the return of hope and victory for reformers and moderates" who backed his candidacy against the divided conservatives in Friday's election. 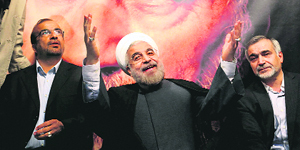 Conservative newspapers said the 64-year-old Rowhani's win was a "victory of the Iranian people". It reiterated a message from supreme leader Ayatollah Ali Khamenei in praise of the conduct of the vote in which 72.7 per cent of the electorate turned out. "The real winner is the Iranian people," said Tehran Emrooz, which had campaigned for Mohammad Baqer Qalibaf, the conservative mayor of the Iranian capital who came a distant second. The conservative daily Jomhuri Eslami said Rowhani's choice is "Iran's yes to moderation and no to extremism". Rowhani, it said, "sends the message that Iranians hate extremist thought and want moderation (as the policy) that runs the country". Former Pakistan President Pervez Musharraf has been indicted by an anti-terrorism court over the detention of dozens of judges during the emergency rule he imposed in 2007. Musharraf, 69, was indicted during a hearing of the case held at his farmhouse in Chak Shahzad yesterday by anti-terrorism court Judge Kausar Abbas Zaidi. He was indicted under provision of the Anti-Terrorism Act and the Pakistan Panel Code. After the charges against him were read out, Musharraf refused to accept them and pleaded not guilty. He filed an application for his acquittal due to lack of evidence. The judge then summoned 23 prosecution witnesses for the next hearing on June 21. Officials said the trial of Musharraf had formally begun with his indictment. The proceedings are being held at Musharraf's farmhouse, declared a sub-jail by authorities, for security reasons. The banned Tehrik-e-Taliban Pakistan has said it will target Musharraf for ordering operations against militants during his regime. The case over the detention of the judges is based on an FIR filed against Musharraf in August 2009. The FIR itself is based on a complaint by a lawyer named Chaudhry Muhammad Aslam Ghumman. The incident occurred at Malahanwala in Hafizabad district, where the young daughter of Muhammad Akram was married off under the custom of 'vani' to settle a dispute that began when he took a second wife. Akram abducted a woman named Munawaran Bibi and later married her out of love, the police said. Munawaran was Akram's second wife. The village panchayat decided to give Akram's daughter's in marriage to Munawaran's middle-aged brother Falak Sher to settle the feud that began after Akram's second marriage. The FIR filed by the young girl's uncle said Falak Sher barged into Akram's house with seven other men, including a prayer leader from a mosque, and performed a forced marriage in the presence of Akram's first wife. Mukhtar Hussain, the police officer investigating the case, said the young girl later escaped from Falak Sher's custody and returned to her parents. The police was carrying out raids to arrest all accused named in the FIR. The FIR, registered on Saturday, named nine persons, including Falak Sher, the prayer leader and seven members of the panchayat. Local residents said the administration and the police were reluctant to act against the accused. Riot police fired occasional bursts of teargas in Istanbul on Sunday after a night of unrest to try to prevent anti-government demonstrators from regrouping ahead of a rally by Prime Minister Tayyip Erdogan's ruling party. Bulldozers removed barricades and municipal workers swept the streets around the central Taksim Square, sealed off by the police, after thousands took to the streets overnight following a raid by riot police firing teargas and water cannon to evict demonstrators from the adjoining Gezi Park. Erdogan had warned hours earlier that the security forces would clear the area around the park - where protesters have been camped out for more than two weeks - before a ruling party rally on the other side of the city later on Sunday. The case has international importance because political stability in Kuwait, owner of more than 6 per cent of global oil reserves, has traditionally depended on cooperation between the government and the elected parliament, the oldest and most powerful legislature in the Gulf Arab states. The source said if Pakistan did not mend its behaviour on the construction of the peace pipeline, it would be fined based on the bilateral agreement with Iran. The source complained about the slow speed at which the pipeline was being constructed, lamenting that the project had not had tangible progress over the past four months.